My friend Carla shared this on her blog a while back and has given me permission to share it here. I offer it to give you a glimpse not only into Carla's life but to the world that my wife Ann and I sometimes live in as well. I have been sad, I despise needing help / assistance from anyone, especially my husband. I feel like a burden, I have little to no independence, & I am so over living in a 3 level house in which I have access to only 1 level. I have boycotted please & thank you from my vocabulary with my husband as he loved to remind me when I didn't say it. I can't stand when I have to ask for anything I need that I cannot reach, or is on a different floor, or even in a different vicinity (needing the van) it's as though the task is being recorded so it can come back at me as if I don't appreciate anything that is done for me - this is never pleasant because it always occurs when I am experiencing a bad day physically & am already ornery. I am learning that caregiving is not for everyone, we were blindsided & this ordeal has been quite a lesson learned, our personalities have changed & the meaning behind the marriage vow "In sickness & in health" does not have to be performed out of love but by duty, you just never know what to expect & no one is at blame & I know my duty is to be grateful that the duties have been met. This is a very difficult way to live! I have been sad, unmotivated, lonely even in my own home, I am kept from so much and the punishment continues because why? 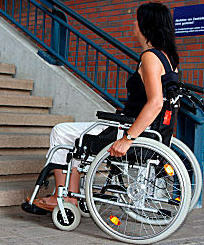 Oh right, I am wheelchair bound. Dang it, it's not my fault, I didn't ask for this to happen to me but I would sure appreciate encouragement verses ridicule. I want to walk, to be able to go upstairs to my art studio & create & be amongst my Wizard of Oz collection, to go down stairs & do my own laundry, to be able to reach anything in the kitchen cabinets, go outside & cut the grass or work in the garden, visit my family & friends by myself or with someone, or go on a (walk) with my husband. So much has been taken away from me, things that made me "me" & now I have so little to replace what was taken & I struggle to pull myself up by my bootstraps & find a new way, I certainly can't rely of any sense of encouragement at home so I have to dig deep within myself, this too will pass. I have faith, & through Christ all things are possible , so no more pity party but it has been beneficial for me to enter this into this blog / my journal so I can remember my struggles & how I got through them.